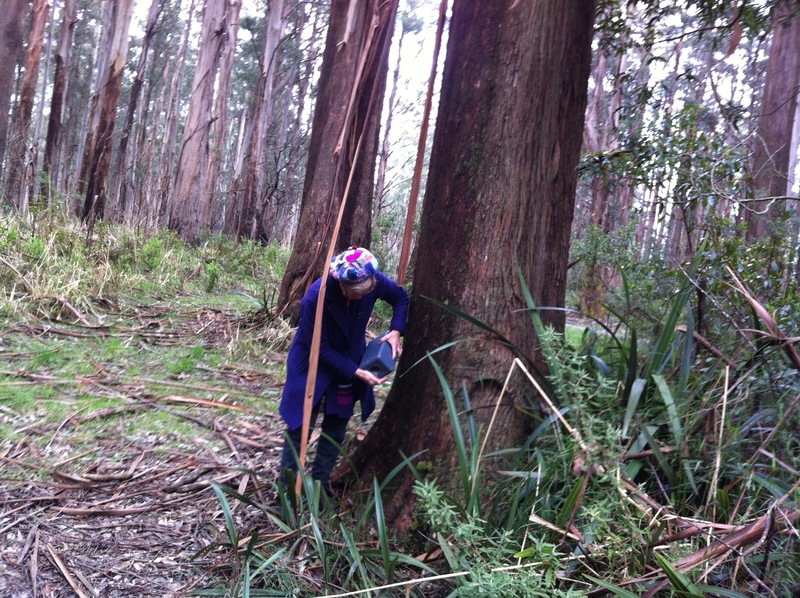 His oldest brother was the first to toss a handful of J’s ashes at the base of some tall eucalypts in the Toolangi state forest. His sisters went next and then the in-laws, including me. Even the grandchildren had a go. We dug deep into the plastic canister where the chalk white and grey grit of J’s remains rested heavy and took a handful of him, then tossed it to the wind. Some stuck to the bark of the mountain ash. We transformed this scattering of J into a photo shoot of sorts, as people do these days, not out of disrespect but because it seemed a good way to keep his memory alive. No one else would. His partners had long ago deserted him and he had no children. Not that any of us knew. The only ones loyal to J right up to the end were his sisters and brothers. But by the time this ritual of final release took place there was no sadness left. J was the youngest and had wasted his life on a belief that he had the gene for alcoholism. It gave him the excuse to drink and smoke twenty-four hours a day and to replace the alcohol with morphine when the cancer that ripped into his jaw took away his tolerance for any other sustenance. J had wanted to offer his body to science, but no one wanted it, given his flesh and bones had started their long descent into decay well before he died. After a few halfhearted attempts at treatment, the doctors left it to the palliative carers to make J’s death endurable, and endure it he did. Shortly before he died, Dennis Potter spoke on the radio about his life and anticipated death, again from cancer. He was reconciled to the idea, though it gave him a strange new hold on life, he told his interviewer. It made him aware of the importance and inevitability of time. ‘Life can only be defined in the present tense,’ he said. The ‘nowness’ of things is all we can rely upon. We can never be certain about the past. It changes with our memory and recall, and the future is unpredictable, as yet unformed, but not the present. To illustrate, Potter described the blossoms that had just erupted on the cherry tree outside his door, as the ‘blossomiest’ of blossoms, so lush, so fluffy, so fragrant, so magnificent. Why had he not noticed them before? Death, Potter said, puts us back in touch with the present in the same way as when we are children. The present is always with us as children in that moment-to-moment experience of being wholly absorbed inside an experience, whether it is one of terror – and there are many terrifying moments as a child – or of bliss. During the interview Potter searched his pockets for a cigarette, half apologised to his interviewer and joked that he could do as he pleased now, as far as taking in poisons, but not everyone was happy. He told the story of a time when he pulled out a cigarette somewhere in a café in America, and the look on the waiter’s face, as if to kill. It comes upon me in a flash that sensation from my childhood, unattached to specific memories just a flash, of light, of colour, of smell. A sensation that erupts when I remember the newness of things, the tiny flowers on the diosma bush outside my garden, pink baby’s breath, the smell of the Rockman’s doll I unwrapped on my eight Christmas, baby sized and pink in its nakedness, as if I had magically given birth to my own baby but experienced none of the pain, only the exultant joy of welcoming this new creature into life. This sensation relates to newness, and now in my sixties, no longer new, I cannot expect too many of these, not in the way of childhood. But I look forward to their return when, like Dennis Potter, I anticipate moving into this new space called death. My husband has gone back to sharpening knives. Not for their murderous properties, but for the sheer beauty he finds in the smooth knife-edge, the blade that can cut a swathe through the hairs on his arm. I find it almost unbearable to watch, the blade so sharp it could splice a single hair. 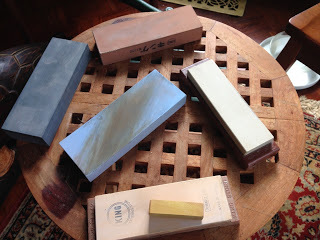 My husband pulled out several of his sharpening stones the other day for the purpose of washing them down in readiness for use. They form part of his collection. Several dull coloured blocks of fine pressed stone against which he rubs each knife blade. 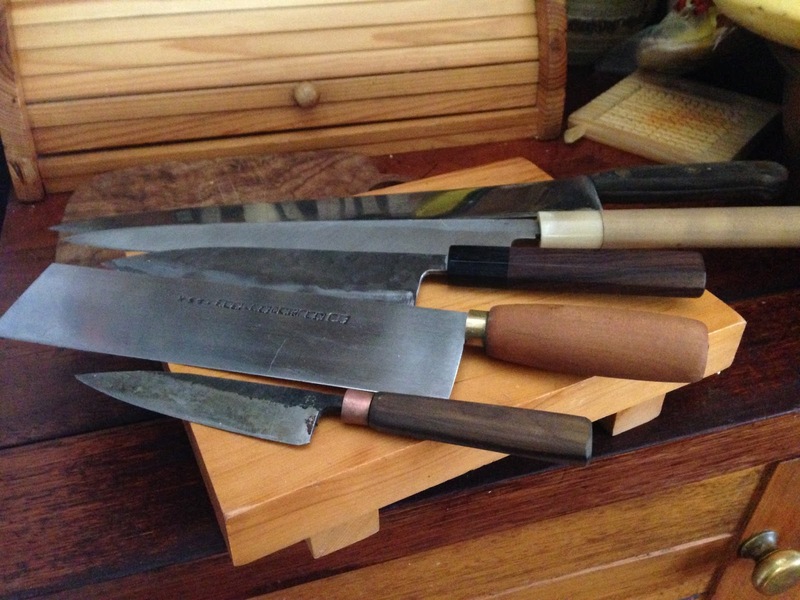 My husband also has a sharpening wheel in the workshop outside, his go-to sharpening stone when friends or relatives come round with their small collection of kitchen knives, blunted from too much use. My husband likes to relax at the wheel and move the blade up and down the surface of the round stone, as it turns slowly with a steady flow of water dripping over its surface. I do not understand my husband’s passion for knives other than the passion of one who likes to collect things. Who likes to have in his possession an example of every variety of knife available: cooks knives, paring knives, fish knives, bread knives, Japanese and German knives, pocket knives and cleavers. Many of these knives we use, others lie tucked away, hidden at the bottom of drawers and wrapped in tea towels or swathes of calico cloth. Recently, my husband came across a man who makes knives for a living, a blacksmith of sorts, who forges his blades to your specifications. The knives come back in rustic form, without handles, unless you pay extra. But they are good knives, heavy to hold and excellent for all manner of food preparation. 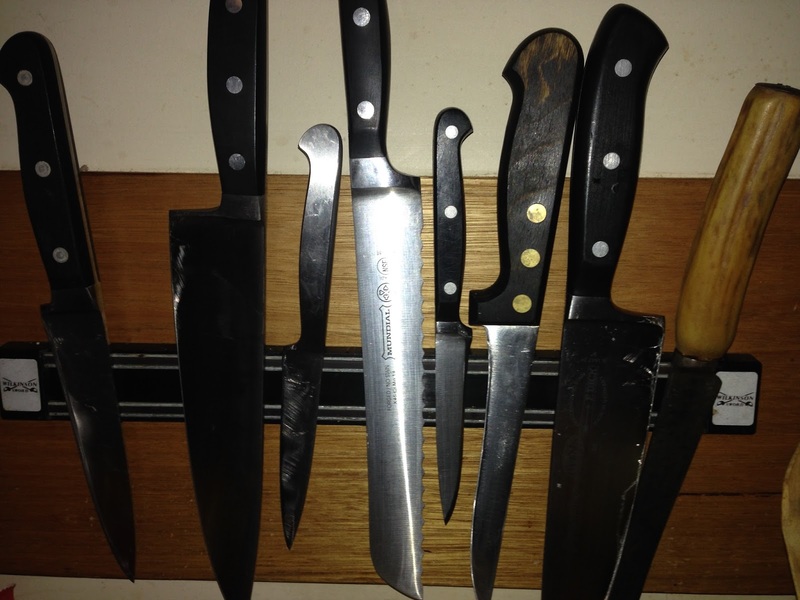 When we go away for a holiday, it is not unusual for my husband to take along a couple of knives from our kitchen. Even when we stay with friends, he does not trust the quality of their knives for cooking and so he brings his own. 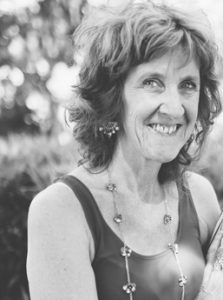 Besides his love of knives, my husband has multiple interests – woodturning, book binding, jewellery making, photography, genealogy, gardening, coin collecting, cooking and preserving – which I pitch against my one obsession, writing. equipment. He had dreams of building a yacht in our back yard and bought books on the subject. He wanted to make something of himself. Who does not want to make something of themselves? And who does not suffer disappointment in the struggle. I thought of these words in the shower this morning as I pondered the fate of my would-be book: Marlon Brando’s words from On the Waterfront, ‘I could’a been a contender’. Yesterday, I met a young woman who will help me to transfer this blog into a WordPress blog. I don’t know whether I dare say this out loud in case the people who currently host my blog, the people at blogspot will object. Not that there are people behind these ventures, real flesh and blood people who can read these words and object to my infidelity. There are matrix like operations behind the scenes that control these processes, I suspect, owned by someone, but I do not understand the workings of these things and therefore have enlisted the help of the technologically savvy. blogging. As if it were a strange thing to continue on such a path instead of moving onto something new. I think again of my husband’s interests. When one starts to lose its allure he can move onto another, and back again. But my passion is relentless. It does not shift, except perhaps in its content. There’s always something different to write about, and yet I am fearful these days of almost every word I write, in case it offends someone. The thought police are loud in my head. ‘How can you say that?’ How dare you utter such things out loud? Do all children learn this? This business of keeping things to yourself, this business of holding thoughts inside for fear of offending someone. Another of those expressions from when I was a child and learned to hold my tongue, but it takes such an effort. Virginia Woolf writes about ‘a finger held to the lips’, a sense that we must not speak the unspeakable. Cut a knife through it.